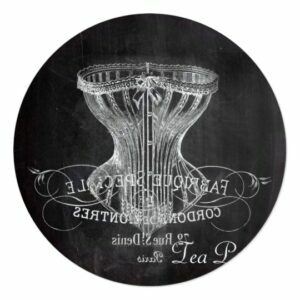 Bridal Shower Tea Party Invitations, vintage bridal shower invitation collection. Vintage Roses Wedding Collection has several colors available. Spooky Halloween, with witches and creepy haunted houses, broomsticks and black cats, the ghosts and goblins will surely be on the lookout for you to scare!! 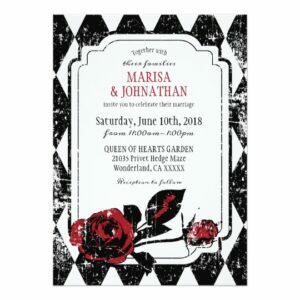 © Sunny Mars Designs – Stylish, modern, elegant, classy, trendy, chic customizable black Gothic chalkboard wedding invitation suite or stationery set with a beautiful illustration of a gorgeous Goth black swirly floral tropical hibiscus design against a blackboard or black chalk board background. 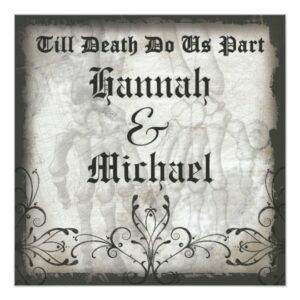 A selection of unique different modern themed wedding invitations for goths, punks, steampunks, horse lovers, hunters, or anything different and alternative rather than traditional white damask. Maybe you’re having a medieval theme in an old castle or a western cowboy on horseback themed wedding or a spooky black Gothic or pagan or wiccan ceremony. 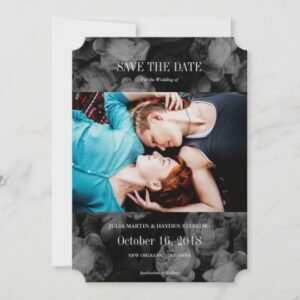 This collection of invitations has a number of other designed invitations that are similar that you can mix and match with. 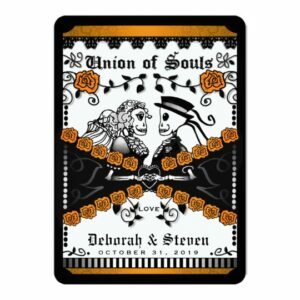 This cool and funky design, called Gothic Skeleton Hands and Roses Wedding, has a black and grey lace background to create a border. In the center there is a white inset frame with red roses at the top. 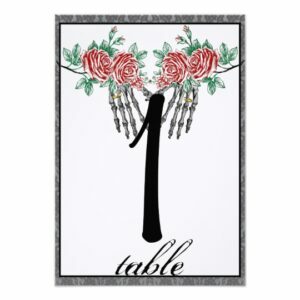 Just below the rose flowers there are two hand drawn skeleton hands with wedding rings. It appears that they are holding hands. 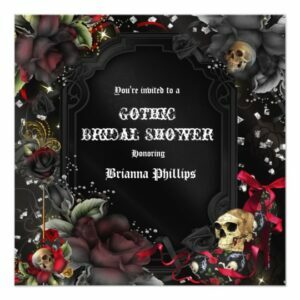 This would be perfect for your Gothic wedding or Halloween event! For anyone who likes a goth (gothic) style. Dark romance abounds. 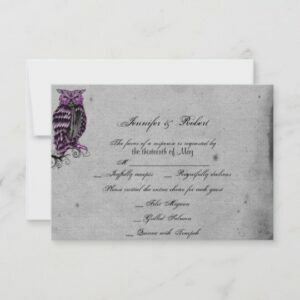 This beautiful and elegant design, called Purple Gothic Owl Posh Wedding, has a cool Gothic inspired design. The background is a grey parchment style with darkened edges to make it appear old. On the left side there is a wicked cool graphic illustration of an owl in black, white and lilac or lavender. 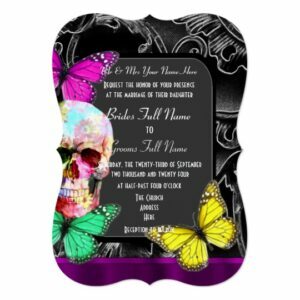 Perfect for a Gothic or Halloween wedding – a Hallowedding. 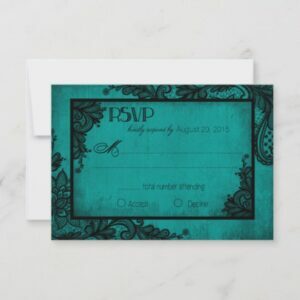 Goth theme with black lace and grunge effect over teal background modern wedding collection. 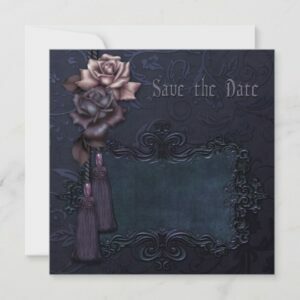 This beautiful and elegant design, called Gothic Black Rose Trellis Wedding, has a pretty grey background with a slight grunge effect. 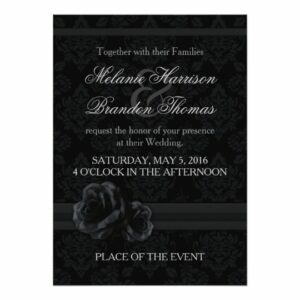 There is a trellis style graphic with black roses and floral designs to either side. 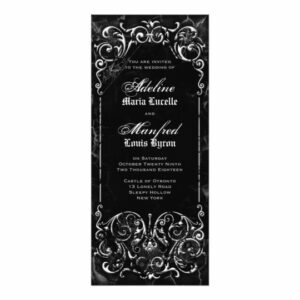 This would be perfect for your Gothic theme wedding or event! 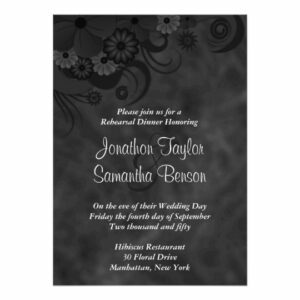 Elegant modern roses wedding invitation set. In either dark red, or black and white – with cream accents. 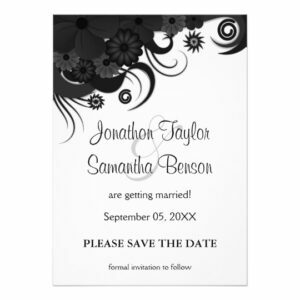 Note that the cream RSVP cards, address labels, and postage go with both the dark red and the black and white set. 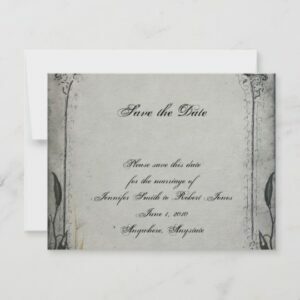 Also note: if you are buying the custom envelopes, you do not need to buy the address labels since the return address is pre-printed on the back flap of cream wedding envelopes, and the address is pre-printed on the dark RSVP envelopes. 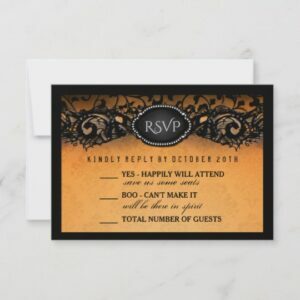 Spooky Halloween wedding invitations! Cobwebs and an ornate, cracked vintage frame with a lightning background. Comes in a variety of colors from: black and white, red, green, and purple. Scroll down to see different color options and a variety of matching products. For custom colors please contact me! Also available as a perfectly haunting Halloween party invitation. 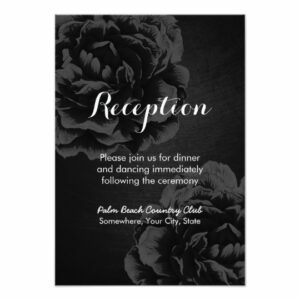 © Sunny Mars Designs – Classy, modern, stylish, elegant, trendy, chic customizable black and white wedding invitation suite or stationery set with a beautiful illustration of a gorgeous black swirly floral tropical hibiscus design against a white customizable color background. 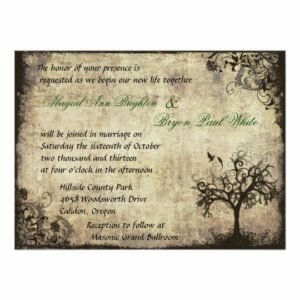 Elegant white lace over grunge rustic burlap modern Goth wedding collection. 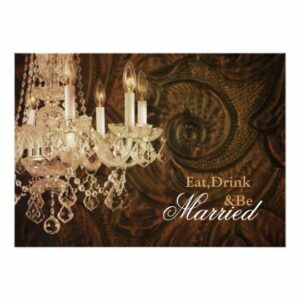 Wedding invitation designs in various styles for a beautiful wedding. Matching items are available for all designs. You can create a whole matching set with my designs in your favorite style. In this collection I only add the wedding invitations, you will find the matching items in my store. If you have a special request or would like me to set-up your invitations for you, please email me at julie@julieagifts.com WEBSITE: julieagifts.com . 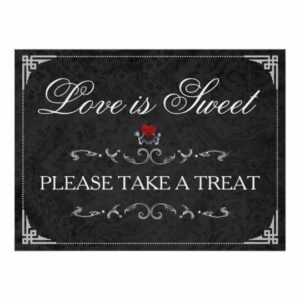 Black and white diamond print with grunge effect, red rose, and heart. 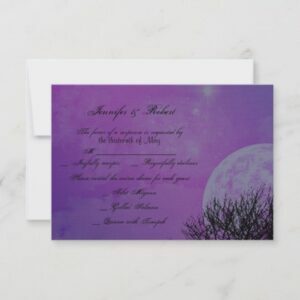 This beautiful and elegant design, called Elegant Purple Gothic Night Posh Wedding, has a cool Gothic inspired design. The background is a purple night time scene with a full moon and a bare tree. On the left side there is a purple scallop box to highlight your text. 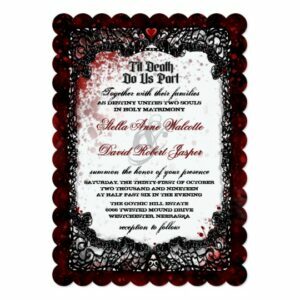 Perfect for a Gothic or Halloween wedding – a Hallowedding. 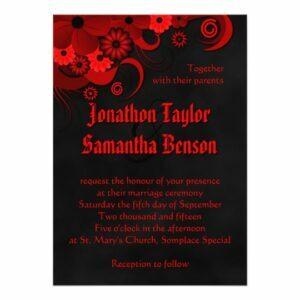 © Sunny Mars Designs – Stylish, modern, elegant, classy, trendy, chic customizable black chalkboard wedding invitation suite or stationery set with a beautiful illustration of a gorgeous Goth dark red, crimson, ruby, maroon or burgundy swirly floral tropical hibiscus design against a blackboard or black chalk board background. 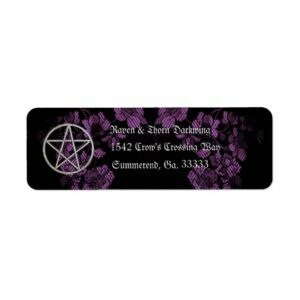 Luxe black and lavender gothic cherry blossom fabric design, with Fraktur font. 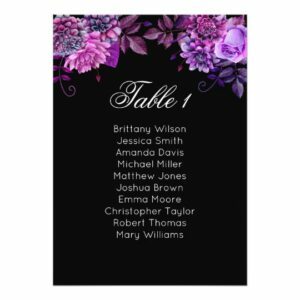 Our 5×7 inch invitations come with a choice of five different edges and choice of twelve different paper types. 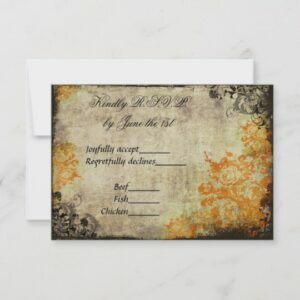 Our R.S.V.P cards are 3.5 x 5 inches available with two edges and twelve paper choices. Back of invitation and R.S.V.P card color and font/style/size/color can be changed through customize button. 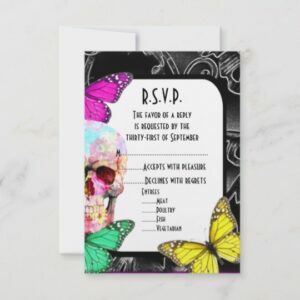 A coordinated matching gothic sugar skull wedding stationary set for alternative black goth weddings.